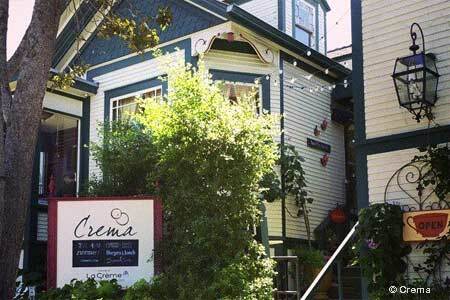 : Located in one of the ubiquitous Pacific Grove Victorian homes, Crema looks like any other breakfast spot. But we were pleasantly surprised by the unusual dishes and quality for Sunday brunch, which presented unexpected culinary high points. The eclectic drinks menu includes hard ciders, beers and a spicy michelada --- a blend of Bloody Mary mix and pilsner beer. Add some sparkle to your brunch with a bottomless mimosa, or just a glass. Coffee lovers will enjoy the smoothness of a cold-brewed cuppa, and if you have a sweet tooth, try an old-fashioned soda float. Waitstaff was knowledgeable about the food. For a treat, go for the fried chicken and waffles. The chile verde burrito is just spicy enough. The lox platter came studded with house-pickled onions, while all three of the five Benedicts we sampled were cooked beautifully, the yolks just soft enough. (We suggest the crab Benedict.) Cinnamon-spiced apples complemented some selections, and the portion of steel-cut oats was more than ample.